I write these updates every week and they are sent to everyone who has signed up to receive them at www.circleofcompassion.org. Hope you like it. uplift humanity’s consciousness, and to bless the animals themselves. When we moved into our rural home 8 years ago, there was a 5 acre lot just to the west of us. Our house was only about 100 yards from the fence line. About 4 years ago, a young couple built a house on the 5 acres. Recently they brought 12 cows to their property. Most mornings I greet them from my front porch, because one of their favorite hangouts is under the trees by our fence. They are literally my next door neighbors and my friends. These cows are so precious and so full of personality. They seem to enjoy my singing and conversing with them about the day. When I am with them I banish thoughts of their fate from my mind, because I just want to share joy with them. However, as they get older, it is getting harder. From my back porch, I saw the neighbor building a corral and chute for loading the cows the other day. I was overcome with a flood of emotions and tears—the desire to stop my friends from being killed, the anger at my neighbor’s ignorance, my grief that then pours into the river of tears being shed by all of us for all animals being killed every second of every day. 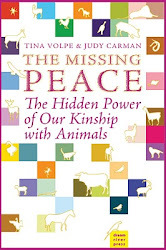 What I want to say to you is that by taking on the liberation of animals we are entering into a profoundly beautiful relationship with animals, but we are also accepting ongoing grief as a part of our lives. We cannot let ourselves be overcome by it, because the animals need us to keep going, but we can give ourselves permission to cry once in a while and share our grief with others who understand. It’s so important. With all this in mind, I wanted to be sure you knew about the Vegan Spirituality Retreat in Malibu June 22 (www.veganspirituality.com). Activists need support, renewal, and tools to help us stay the course and not burn out. I will be one of the speakers this year and would love to see you there. As airline attendants tell us on every flight, we must put the oxygen mask on ourselves first so that we can help others who aren’t able to do so. This week let us send out prayers and caring thoughts to all activists. May all of you feel the comfort and guidance of the Light of the World that dwells in us and in everything. May all of you feel the Love that surrounds us all, shows us the way to free the animals and gently reminds us to take care of ourselves so that we can care for them. Thanks to all of you, compassion is encircling the earth for all beings. Thank you for your devotion to truth, love, liberation and peace for all beings. May all beings be happy. 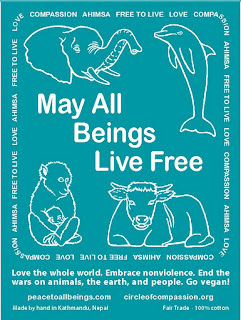 May all beings be free. Please visit the website www.circleofcompassion.org often to see updates and special prayers, and also to join in our “A prayer a day for animals” which features a prayer for a different group of animals each day of the week. Over 800 people are signed in to this Prayer Circle at circle of compassion. Many more are joining us when these prayers are shared via social media. Please share this widely so that we may continue to add more people to our ever-expanding circle of compassion.